My first recollection of eating Oliebollen was during my first visit to the Netherlands, some 17 years ago. I stood in the middle of the Plein, in the city centre, on a cold wintery afternoon, light snow was falling, it was wet, dark, and cold. Everyone was running around doing their Christmas shopping for Sinterklaas (celebrated on the 5th of December in the Netherlands). And there was a glow, the glow of an oliebollenkraam, attracting people seeking a bit of warmth but most of all, to buy an oliebollen. The literal translation of oliebollen is oil balls, which really doesn’t sound that appetising. They are also commonly known as Dutch Doughnuts. Traditionally, oliebollen are eaten during the last two months of the year, but are most popular on New Year’s Eve. So much so that if you decide to partake of the Dutch tradition you could find yourself queuing for some time and, if you don’t make it to the bakery early enough, prepare to be disappointed. First eaten by Germanic tribes during the Yule period (26th of December to the 6th of January) in the Netherlands. It is believed that the fried dough was used as an offering to appease the Germanic goddess Perchta and her evil spirits who used to fly through the winter night skies. 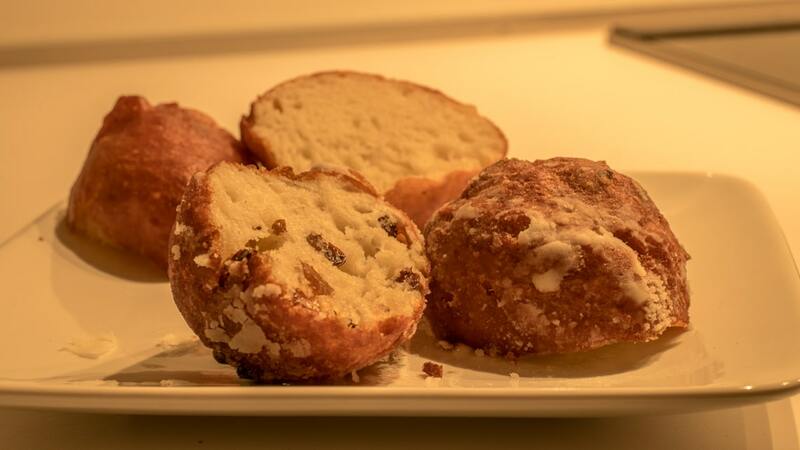 Oliebollen first started appearing in paintings from around the 1600s. Purchased from an Oliebollenkraam, your chosen flavour will be served on a white napkin and you will be offered the option of poedersuiker (icing sugar), which is liberally sprinkled on the top. I would recommend to take the icing sugar along with the raisin ones, although depending on how much of a sweet tooth you have, it’s up to you. You can buy several oliebollen and warm them up at home — if you do, then make sure to ask for the icing sugar on the side. Simply mix the ingredients together, cover and put in a warm ventilated place for an hour, until the dough has risen. The dough mixture normally doubles in size. Once risen, bake the dough immediately, for the freshest results. Using an ice-cream scoop, or two desert spoons, take a ball of the dough mixture and drop it into hot oil for five minutes or until golden brown on the outside. Remove with a slotted spoon, drain on a paper towel, dust liberally with icing sugar, and enjoy. One of the Dutch national newspapers runs a yearly competition to find out who bakes the best oliebollen in the Netherlands; it’s a much-anticipated event by bakers across the region. A very close friend of mine, who is Dutch and worked in an oliebollen shop in her younger years, was kind enough to tell me, what oliebollen mean to a Dutch person . To the Dutch, oliebollen signify Christmas, winter, cosiness, family time, warmth, and coming together. At the bakery she worked in, on New Year’s Eve it was necessary to be at work at 4am to prepare enough oliebollen for the opening at 8am, by which time a 15-metre line had already formed outside.